I wanted to write this post for two reasons. One, to document the first time I attended a K-pop concert in Korea – something of a bucket list goal that I always wanted to accomplish ever since I started down the slippery path that is fan-girlism. Two, to share my experience with SMTOWN Travel’s S.M. Global Package for anyone who is considering travel for a concert. If the title and big picture above isn’t clear enough already, I watched EXO’s encore concert of their 3rd world tour – The EXO’rDIUMdot in their home ground of Seoul in May 2017. Why Select SMTOWN Travel’s Global Package? 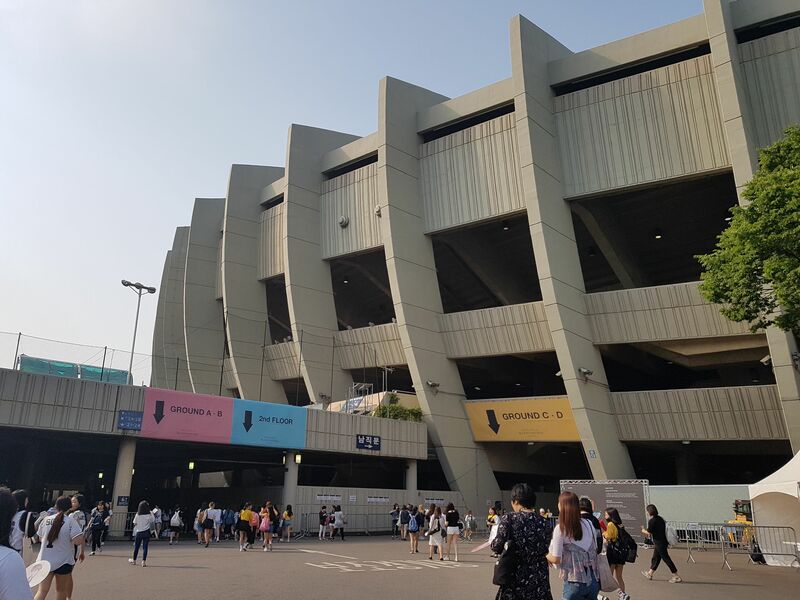 If you are reading this post, you most likely are a fan of K-pop and you would know just how notoriously hard it can be to get tickets to concerts in Seoul. Well, luckily for international fans, S.M. Entertainment has their own travel agency in SMTOWN Travel and you are given a chance to watch your favorite artists on stage. While chances of you getting a ticket via the Global Package is definitely higher than going through the regular ticketing channels, do take note that for the Korean concerts at least, places are likely to be limited and sell out fast. I opted to take up the Global Package for the security of knowing that I would have secured my spot for the concert with an official ticket (and not try my luck getting a ticket from a reseller or scalper) plus the convenience of having transportation to/from the concert venue (this was especially important for me even though I am relatively familiar with Korea). Make up your mind ahead of time whether you want to see just one night, two nights or all nights of the concert once dates are released. I say this because I dithered over my choice and eventually semi-regretted that I only opted for the final night of the concert. From my booking experience and reading other write-ups of the Global Package for previous tours, there will usually be 3 or 4 categories of the Global Package for concerts in Korea. Premium (which is the full luxury and works), Deluxe or Superior (lesser than Premium but better than the next category), and Economy (cheaper but good enough). All categories will come with options for the number of concerts/nights that you could possibly want to attend. All categories also have the option for a Single (solo) or Twin (share with a friend). Once you have secured your preferred Global Package reservation, it is important that you make payment to confirm your spot as soon as possible. I have heard that the second round of tickets is released because people didn’t make their payment on time to confirm their reservations. (You wouldn’t want that to happen to you, right?) SMTOWN Travel only accepts credit card payments via PayPal, so it would be wise to make sure that you have a valid card attached to your PayPal account before the booking frenzy starts. Another thing to bear in mind is that the Global Package only covers the cost of your concert ticket, accommodation, transportation to/from the concert venue, and tours (if you opt for it). Your flight tickets to Korea (or whichever country it is) and transportation costs to your hotel are not included. What Happens Next After You Successfully Booked Your Global Package? It may seem a bit anti-climatic, but you don’t get any official emails about the trip or the concert until two weeks before. Then there will be a flurry of emails with details about your hotel and surveys on preferences for food and tours depending on which tour category you selected. And most important of all, the opening of pre-orders for concert merchandise. You get to pre-order your concert merchandise and they will deliver it all to the hotel for you so you don’t have to lug your stuff with you to the concert venue (unless you want to do so, of course). Other than that, all you have to do is book your flight tickets and do whatever (fan) preparations you need to enjoy your experience to the fullest. SMTOWN Travel will usually set up a booth in the lobby of the hotel you are based at. For this trip, I was at Hotel Peyto in Gangnam. If you have pre-ordered any concert merchandise, this is when you’ll pick it up too. Bring along your passport (or ID equivalent) and a print-out of the receipt for your pre-ordered merchandise to speed things up. For a true blue (or die hard) fan, you’ll probably need to allocate a good portion of your luggage space to bring back all the goodies and fan merchandise. If you have opted for the tours, you’ll have to be up bright and early. 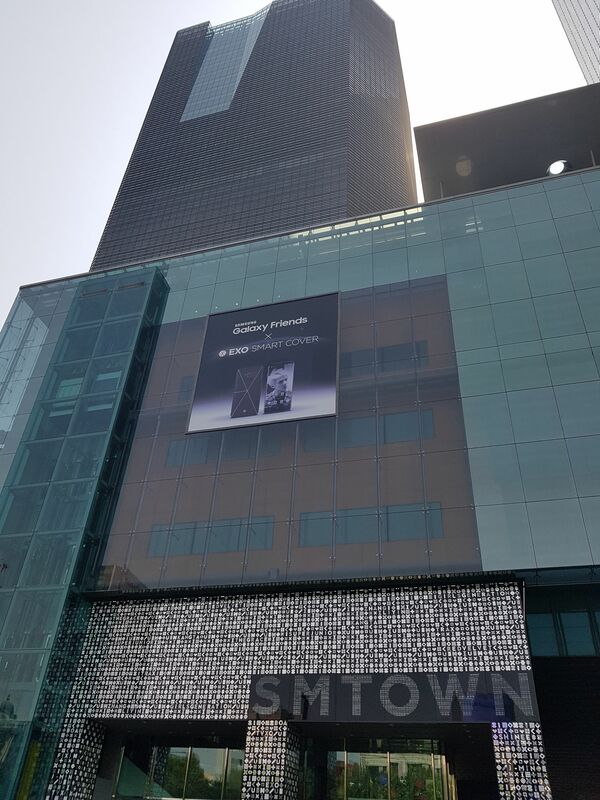 Otherwise, your day starts in the afternoon when you are picked up from the hotel to stop by SMTOWN at COEX Artium to spend on yet more merchandise. 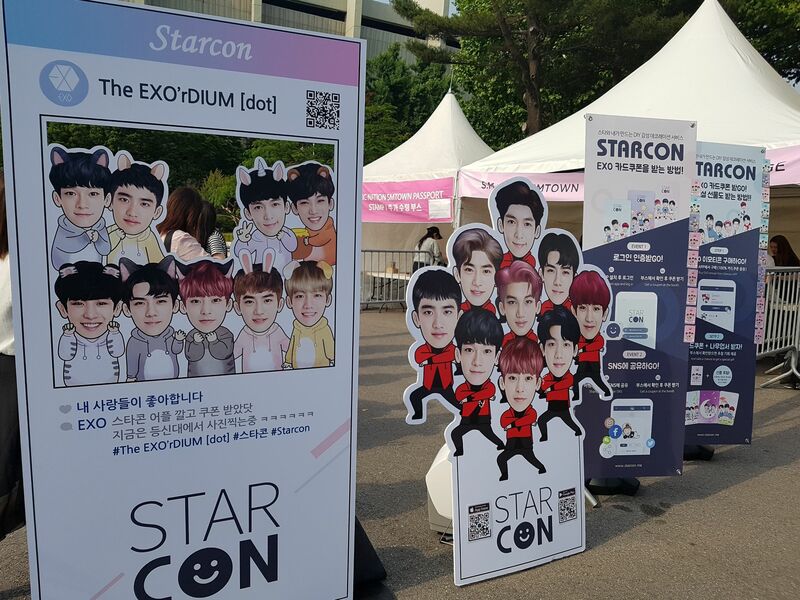 The tour guides will be handing some extra goodies at this point – for EXO’rDIUMdot it was random magnetic bookmarks of the members. After that, you’ll be whisked off to the concert venue, which is where the concert experience really began for me. 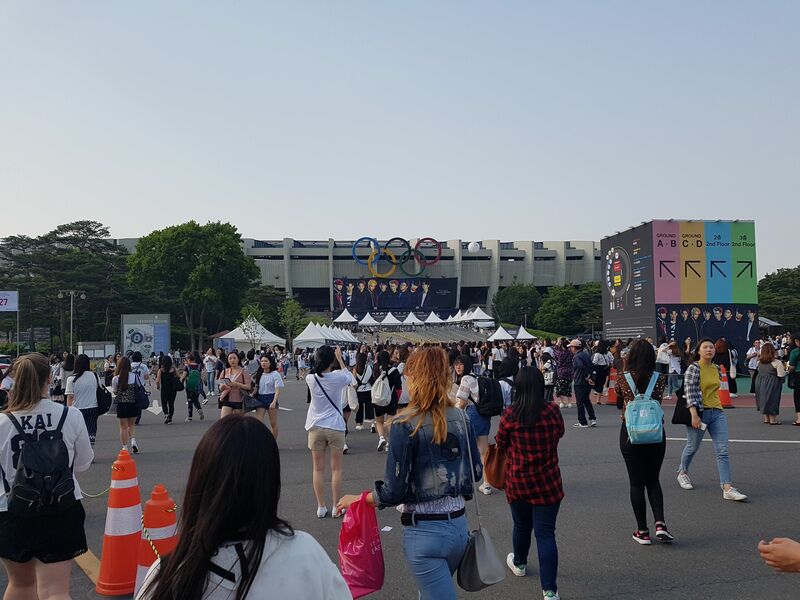 You will arrive at the concert venue with plenty of time to walk about – I highly recommend you do as there are usually activity booths where people queue up and also it’s a great time to look around for your favorite fansite masters and get more fan merchandise or banners. If the concert you are attending uses the Wyth app, make sure you install it! 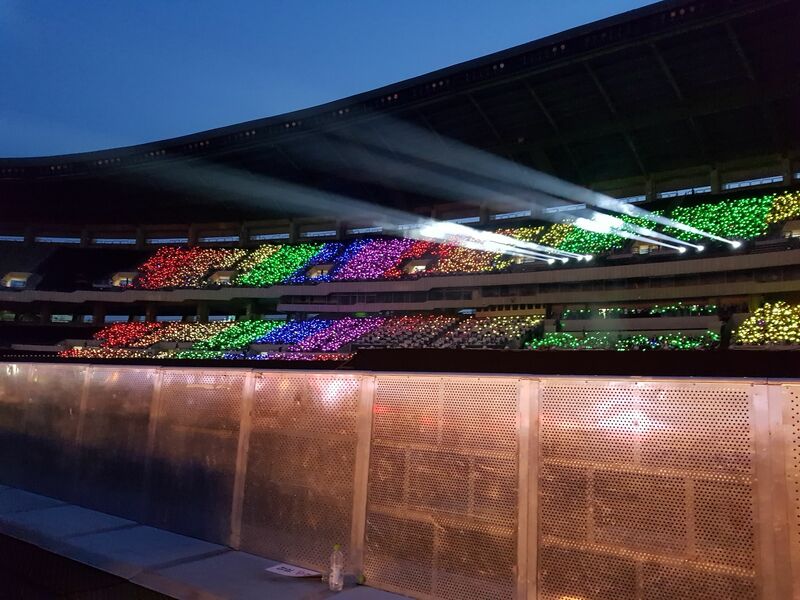 This technological marvel totally enhances the experience as evidenced by the beautiful light stick rainbow formed by EXO-Ls during the EXO’rDIUMdot. After the concert ends, you will have about an hour to exit the venue and get back to the buses that will take you back to your hotel. As a sweet finale, SMTOWN Travel provides something light to munch on and another bottle of water to re-hydrate you after all the screaming and singing you would have done. 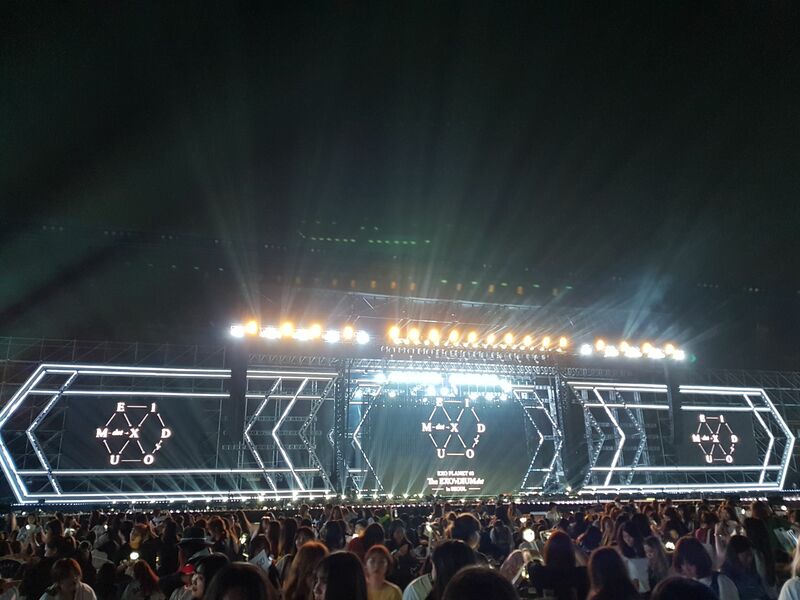 Having attended several EXO concerts outside of Korea, I can say for certain that concerts in Korea are of an entirely different level altogether. For one, the boys are on home ground and it shows so clearly. Not that they aren’t professional in giving a great performance in other countries, but their comfort level and confidence just skyrockets in Korea and it is so tangible. Not only do the artists feel closer to the fans, but the fervor and dedication of Korean fans are really something else. Fan chants, sing-a-longs, special events, banners… it’s amazing to see how united the fans are. Also, because the venue is on home ground, the technical scale of lighting, pyrotechnics, fireworks, lasers, and all of the stuff that makes up a concert – it really is on a different level all together. Lastly, while I am all for every fangirl (or fanboy) to see your idol on stage, as a responsible adult I would add that you should make sure that you are well aware of what you’re getting and also your financial capabilities. Oppa (or hyung) wouldn’t want you to go into bankruptcy for him. 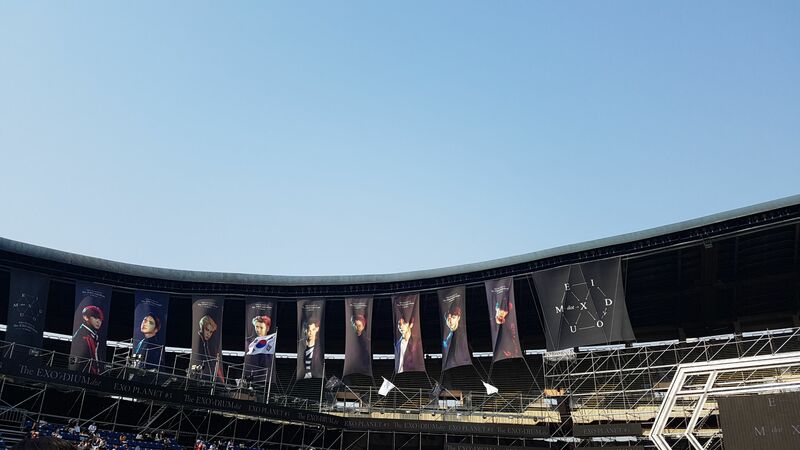 Recommended : GoKaiKai’s extended guide if you have queries on the Global Package and how it works or read GoKaiKai’s account of The ElyXiOn in Seoul here. Hi Subaek, usually SMTOWN Travel will send you notifications via the Personal Notice. In any case, the pre-order merchandise is not open yet as of today’s date. Hi, I think this is an economy package that you have taken up? Can I know where or which section you were seated? 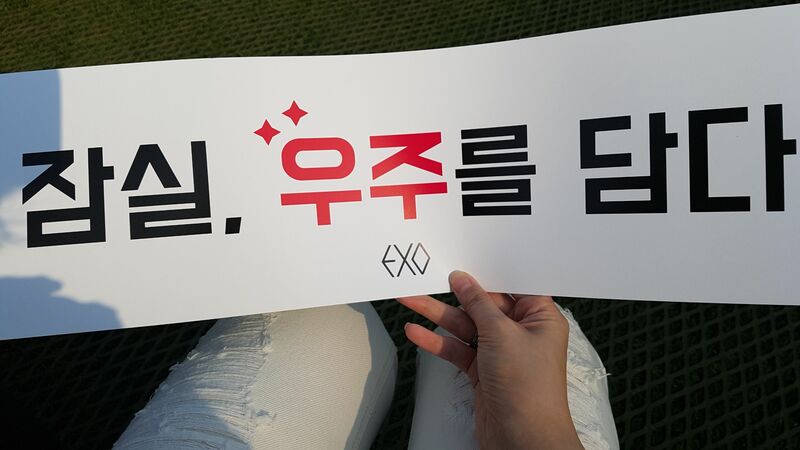 I am considering for this upcoming encore. I saw the other of your post and you mentioned that the seats provided for premium and economy package are different. Just want to know from your experience if it’s worth to purchase economy package. 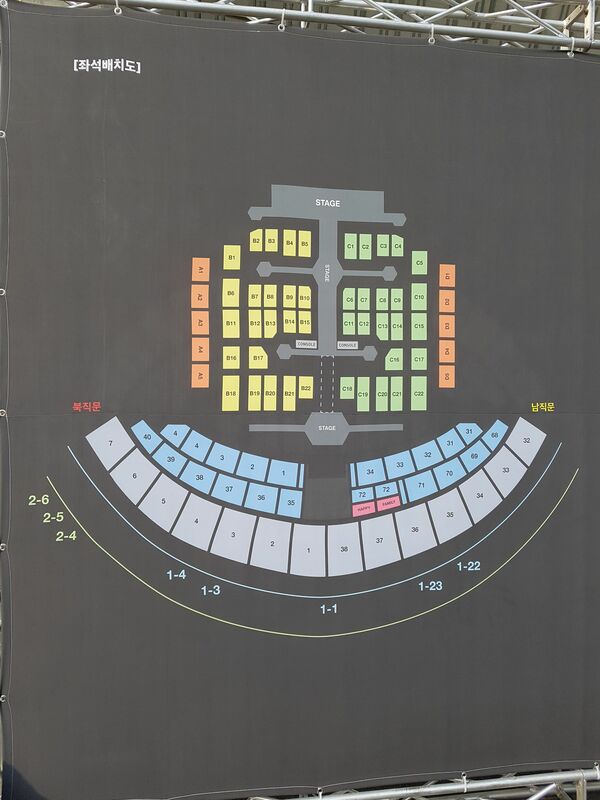 Hi 지현, yes for the EXO’rDIUMdot I was on the Economy package and the seat I got was near the ‘wings’ or extended part of the secondary stage. I can’t advise you which package is more worthwhile as each person has different priorities and values. Only you yourself will know if you want to take up a global package. Sorry! Hi Raiya512, if your objective is just to attend one of the boys’ concerts in Korea then the economy package is fine. I can’t really say more than that because everyone has different expectations and wants. Hi, may I know if the EXO light stick included in the souvenir or we have to pre-order it ? Hi Emi, the lightstick is not included in the package souvenirs. You will need to purchase it separately. Whats some of the benefits of the premium package? I’m planning on going to Elyxion dot but I can’t seem to find any details about what makes the premium packages so much better then the other options. What are some things that the premium package get that economy doesn’t? 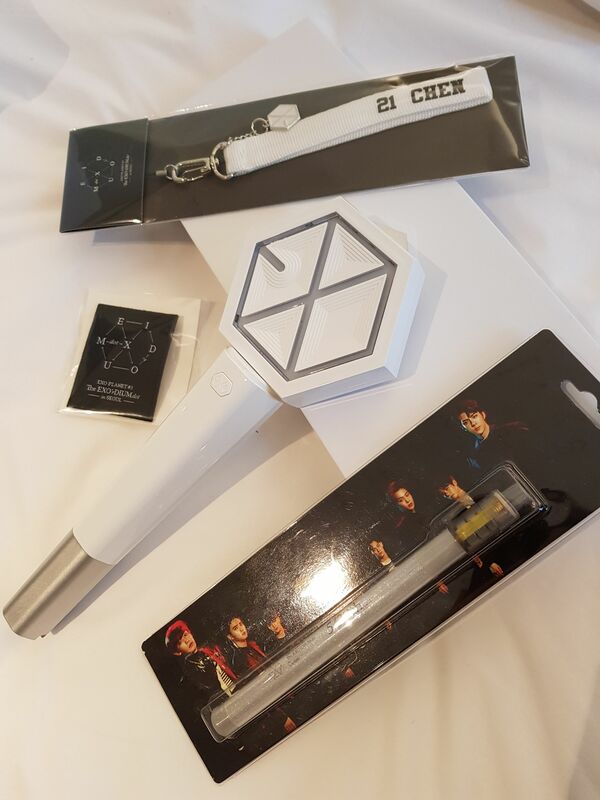 Hi Gumintou, I suggest you read my blog post on the ElyXiOn – I took the Premium package there. Not at all, it’s my pleasure to help a fellow K-pop fan out. ^^ Cheers! Hello! Thank you for sharing this information with the world wide web. I hope you don’t mind but I just want to ask for SHINee and clarify things about the Global Package. If I buy Global Package for a Japan concert, do I have to go through the Japan system (Official fanclub membership, Japanese address, Tickebo, etc) of acquiring tickets? Do you have to follow the same measures that the official Japan fanclub should go through? Or is Global Package a totally independent entitry from the Japanese fanclub? Thank you so much and more power to you! Hi Jimi, thanks for reading my blog! ^^ I can confirm that the Global Package is definitely separate from the Japan fanclub as you are not asked for or required to provide any info on fanclub membership at all when buying a Global Package. Unfortunately this also means that if there are any special events (eg. fanmeet) arranged for the official Japan fanclub, you won’t get preference or early dibs on tickets for those events via the Global Package. Hope this helps and that you get to watch SHINee at the Dome! I just wanted to ask regarding tickets do you get good seats even though it is random ? I mean is there a chance if the venue is big to get seats that are really far away from the stage ? Hi Fotini, so far I’ve had pretty good luck with seats – about 2-3 rows away from the stages. I’ve also spoken to fans who got a front row seat for their section (lucky them!) but also heard of fans being assigned to sections that are further out. My personal theory is, if you want to ensure getting a better seat that is closer to any part of the stage, technically the more you pay the chances of getting a ground section ticket is higher. But again, your mileage may vary as they really make it a lottery game of chance by randomising the tickets. Hi. Can you actually bring your own handphone/camera inside the concert hall? Hi Meza, most (if not all) concert venues prohibit cameras as they do not allow photos or video recordings. You are usually allowed to bring your handphone in, but the same restriction on photos and video recordings apply. If you choose to bring a camera or use your phone to take photos and videos and are caught doing so, the concert organisers have the right to make you delete the photos/video, remove and keep the device from you for the duration of the concert, or even order you to exit the concert hall. I often wonder how to get a global package & now I know how to get it. I already registered myself there, but I was just wondering if we will get an email about our registration (e.g. a confirmation link, maybe?) because I didn’t get any. Btw, currently checking for EℓyXiOn package and it’s closed, omg. Hi Cynthia, thank you for your kind words! ^^ Sorry I can’t remember if there’s a registration confirmation email when you first create a new account on the SMTOWN Travel website as it’s been a year or so since I did so. Don’t give up hope just yet for the ElyXiOn – there’s still a few more days next week before the ticket sales open to the public and there is always the possibility that they will open a round 2 of Global Package sales. Hopefully you’ll get to see the boys perform live in concert! Just wondering about what I’ve seen other people get, and was wondering about that whole hotel room that is like decorated in heaps of EXO merchandise and whatnot. I’ve heard different things from different people, and was wondering if you knew about it? Some say that that package is one you have to apply for, some say it’s randomly drawn and then some say you can purchase it right off the bat and that the premium package comes with that hotel perk (since it’s so expensive haha). Also I noticed your use of ‘true blue’, are you a fellow Aussie? Hi Rin, thanks for reading my blogpost! ^^ Ah, that fabled hotel room – yes I’ve heard about it but have not yet experienced it for myself (it’s on the bucket list though). My take is that it’s a Premium or Luxury package which is why it costs an arm and a leg, because not only do you get a room full of EXO merchandise, you also get other perks like a backstage tour and more meals thrown in as well. For a while I thought it could be a fan club experience thing, until I signed up for my first Global Package and there wasn’t such an option. Not much help I know, just my two cents worth of opinion. Haha, sorry not a fellow Aussie though I would love to visit Australia (I’ve never been there yet! Gotta rectify that soon…) and have extended family members staying there. Cheers! I saw the price for the package and changed it from USD to AUD and it's 1.2K for the premium package T.T I was basing my budgeting off of a previous SM group's package that I was looking at hoping it'd be around the same price but it's a solid 200 bucks more, which I guess isn't too bad if you get special treatment haha. It's a once in a lifetime experience, so I'll definitely be saving up… My hope is that Suho didn't lie about them coming back down to Australia for EXO Planet #4, because it's rumoured to be the biggest and best one yet! It'd be nice to only have to get on a plane for an hour and pay 200 bucks for tickets haha. Hi Rin, thanks for the Instagram follow and kind words! ^^ Just doing my lil bit to help out fellow fans as I searched the Internet for information on the Global Packages previously and couldn’t find what I was looking for. The Global Packages certainly don’t come cheap and I *think* the price for EXO is slightly marked up compared to other groups plus there is also a small price increase between the EXO’rDIUMdot and the ElyXiOn. If you’re budgeting for the next Global Package maybe factor in a 5% increase from the category you were looking at for the ElyXiOn? The other alternative would be to catch the boys in Australia or maybe a Southeast Asia country that’s nearer to you. But if leadernim said they would be headed back to Australia then I think it’s possibly a very good heads up or spoiler! Hope you get to see the boys perform live in concert one day! Hello! I was wondering if you remember how the process for getting a global package was. Do EXO’s packages get sold out as quickly as a (regular) concert ticket? How fast do I have to be to secure a package? Because I usually help my sister buy tickets for concerts in Seoul for other groups (not nearly as famous as EXO) and it’s so hard to secure a ticket. Hi Honey, the process of getting a global package is pretty straightforward. Just be sure to create an account with SMTOWN Travel ahead of time (you’ll need an account anyway to be even able to get to the package selection screen). Payment is accepted via PayPal. While the global package certainly does not get sold out in seconds like a regular concert ticket, do bear in mind that quantities of tickets are limited (more so than a regular concert ticket) and you’d also be competing with hundreds if not thousands of global fans for your package of choice. I’d say that there is more breathing room than the mad scramble that is getting a regular concert ticket but again, it’s not a guarantee. I myself missed out on the first round of packages for my trip and lucked out with a second round. Best way to ensure securing a package is to log in at the stipulated date/time and cross your fingers. Hope this helps and you (or your sister) get to see the boys in Seoul! Hi Honey, based on my past experience, I would say it depends more on the package level you’re aiming for. This is because availability depends on the number of rooms at any one particular hotel that SMTOWN Travel has probably booked. Hence that is more of a limiting factor (to me) than a single or twin package. Also whether you intend to watch all concert nights will be a factor as well – eg. there might be less tickets (and therefore packages) available for say, a final or opening night than the one in the middle. Your package (and ticket) s only reserved once payment is complete so I personally can’t relax until I get the PayPal email receipt that the payment went through. You have 2 hours to complete payment before it gets re-released for sale. Hope this helps and you get to see the boys live in November! Hi Honey, it’s my pleasure to have helped and so great to hear that you managed to get a package! ^^ The website was really laggy at my end and I didn’t get my first or second choices but I did get one in the end! I’m going for the first day as well – hopefully we’ll bump into each other somewhere along the way. Cheers! Hello. Do you remember how much was the price for attending 2 days concert? Hi Alex, sorry I can’t remember the exact price for two nights of concerts but I think it would be safe to factor in an additional USD 200 for the Economy package bearing in mind that you’re paying for an additional night of both concert plus accommodation. This price will increase based on both number of concert nights you’re planning to attend and the package category. Hope this helps and that you get to see the boys in Korea! Hi Nurul, all the Global Packages are priced in USD so you’ll need to do your own conversion to MYR. I chose the Economy package and that was already USD499 for one night concert ticket and two nights accommodation. Hope this helps and that you get to see the boys in Korea!